We need your help! For many years we had children from our schools in India visit the U.S. They would tour the country and share the stories about how child sponsorship through Bibles For The World was changing lives. It’s been years since we’ve been able to host a group of children from India. So the question is — who will tell their story? Maybe God is calling you to tell their story? 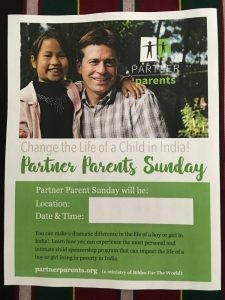 Partner Parents Sunday is an opportunity to do just that…to share the story of your sponsored child with your church, Sunday School, small group, etc., and invite them to join you by sponsoring a child. We’ll provide material to help you plan and run your Partner Parent Sunday. We’re asking God for 10 sponsors to host a Partner Parents Sunday in 2018. Will you pray about being one of them?